Amanda Mcdonald Crowley och Marek Walczak ligger bakom triennalen. Kulturföreningen Triennal and Public Art Action are delighted to announce that Agrikultura, an exhibition of public artworks, installations, meals, performances, urban interventions, mobile kitchens, and events to take place outdoors in Hyllie, Malmö, opens on 1 July and will be open with various programs scheduled every Friday, Saturday, and Sunday until 27 August, 2017. Check out our map for exact locations of the artworks! The project is realized and installed on 8 hectares of the future “English Park” in Hyllie, and includes artworks, performances, and projects by: Agata Bielska (PL/SE), Antonina Simeti (US), Åsa Maria Bengtsson (SE), Bent Bøgedal Christoffersen (SE), Bjørn Wangen (SE), Egle Oddo (IT/FI), Erik Sanner (US), Farah Marie Velten (US), Grit Ruhland (DE), Gunnel Pettersson (SE), Håkan Skytte (SE), Helena Marika Ekenger (SE), Jessica Segall (US), Johanna Kindvall (SE/US), Josh Miller (US), Juanli Carrión (ES/US), Kira Nam Greene (KR/US), Leonardo Aranda (MX), Luke Lowings (UK), Malin Lobell (SE), Marek Walczak (UK/US), Mari Keski-Korsu (FI), Marianne Morild (UK), Mark Shepard US), Martinka Bobrikova (NO), Mary Mattingly (US), Monix Sjölin (SE), Oliver Kellhammer (CA/US), Oscar de Carmen (ES/NO), Rendel Ibing (DE/SE), Robert Ek (SE), Rory Solomon (US), Sam Van Aken (US), Shu Lea Cheang (FR), Sophia Warsh (US), Ursula Endlicher (AT/US), Wes Heiss (US). Many of the artists will be present at the opening, and several will be doing performances, tours, and workshops on our Opening Day. We invite you to join us to explore works in the fields, and participate in workshops and performances. Bring bring a picnic, food to share, picnic utensils, glasses (and if you have it, also a picnic blanket or cloth) and join us in the park for a celebratory picnic at 17:00. We will provide a celebratory drink, prepared at Johanna Kindvall’s Field Kitchen. Take a walk around the fields and listen to Rory Solomon’s Radio Tree Malmö in the woods; explore Oliver Kelhammer’s Neoeocene grove of ancient trees; pick lettuce leaves from Åsa Maria Bengtsson’s Edible Carpet; forage from Cluster, Malin Lobell and Mary Mattingly’s permaculture planting; hang out at Oscar de Carmen and Martinka Bobrikova’s Kitchen Dialogues installation; find Farah Velten creating cyanotypes of current festival blooms or possibly foraging edible plants for her Agriphoto-Culturagraph; visit Monix Sjölin as she builds her Spirit House. Join Holma and Kroksbaäck residents for the planting on OSS#HL a healing garden made in collaboration with Juanli Carrión to commemorate more than 25 years of Självförvaltning. Join Mari Keski-Korsu and Grit Ruhland for their environmental-sound-project, Calling for the Others, to learn kulning – traditional cattle calling. Ursula Endlicher will give tours and provide bites sampling the functionality of the input fields. Join instigator of Martian Weed and Pest Utility Research Erik Sanner for a workshop to explore how we might survive on Earth, on Mars, on the Moon, on a space station, or under the ocean. The most powerful ideas are only adopted through conversation, through sharing, through exploring reality together in creating something out of our limited understanding. Join Jessica Segall for a pin-hole camera workshop, for a bees-eye view of the world. Join Malin Lobell for a composting workshop, and explore the world from the perspective of worms. As part of her Ark of Seeds installation, Egle Oddo will offers to the public miniature edible sculptures filled with seeds and herbs. They have been designed in collaboration with chef de cuisine Lorenzo Eleuteri. Get to know Hedgrerow Hyllie. Learn how to interact with her, access the data that she generates and see how she impacts the local ecosystem. Join Bent Bøgedal Christoffersen and his pig collaborators for a sound performance in the Open Room. Join us for a communal picnic in the fields!! Please bring picnic supplies, and food to share! We will make a long patchwork of everyone’s picnic blankets and celebrate together. A key goal for Agrikultura is to imagine sustainable solutions to food in cities. We will explore permacultural solutions – systems of agricultural and social design principles centered on simulating or utilizing patterns and features observed in Swedish ecosystems. Artists will work with city gardeners, youth groups, and citizens to reimagine urban landscapes taking into account ecological design and engineering, integrated water resource management, and sustainable landscape design to develop regenerative and self-maintaining habitats. We aim to create a unique experience, that will not only be beautiful but that will engage our audiences in meaningful ways to think about what practical roles we might play in imagining the future of our food systems, in expansive, sustainable, and delightful ways. and the Kulturföreningen Triennal team. Agrikultura is organized by Kulturföreningen Triennal. We have been fortunate to secure support from the city of Malmö, and the state of Skåne, as well as considerable in-kind support from the City Department of Parks and Recreation. Agrikultura projects and infrastructure have been realized in collaboration with Holma Folkhögskola, MKB Fastighets AB, Holma community and Självförvaltning, Ung I Somar, Praktik vid Events, Hvilan Utbildning, Eiras Gröna. Artists have received additional support from Kone foundation, Svenska kulturfonden, Frame Contemporary Art Finland, Nordic Culture Point, Nordic-Baltic Mobility Programme, Arts Promotion Centre Finland, Spanish Embassy Stockholm. Special thanks to Susanna Kapusta, Ola Melin, Lars Qvint, beekeeper Istvan, Werner Rohwedder, Jette Kjær, Åsa Hellberg, Bahram H Maaf, Anna Kindvall, Christer Berg, Mona Kindvall, Jytte Jonna Hansen, Eva Stene, Kari Mjåtveit, Sara Högberg, Anja Nilsson, Kenton Knowles and to all of you who have contributed with labor, plants, seeds, watering, building materials, and food. SAVE THE DATE: Agrikultura opens on July 1, 2017 in Hyllie, Malmö, Sweden. Kulturföreningen Triennal is delighted to announce that Agrikultura, an exhibition of public artworks, installations, meals, performances, urban interventions, mobile kitchens, and events to take place outdoors in Hyllie, Malmö, opening on July 1, 2017 and running until August 27, 2017. 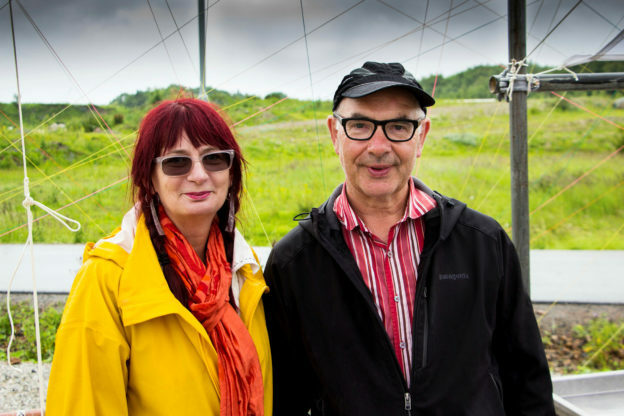 The Agrikultura curators are Marek Walczak and Amanda McDonald Crowley. The project will be realized and installed on 8 hectares of the future “English Park” in Hyllie. Some of the questions we wish to address with the project include: What is our present relationship to the land? How can we augment and redefine our cultural and emotional connection to a nature that we have over-extended? How can we re-engage with a nature we have pushed ever further from our lives? OSS Holma Healing Garden: Juanli Carrión (ES/US) will work with citizens of the adjoining Holma neighbourhood to build a healing garden of medicinal plants. Strange Harvest: Rainer Prohaska (AT) will establish a temporary cooking-lab where research will inform food experiments and cooking performance will take place. 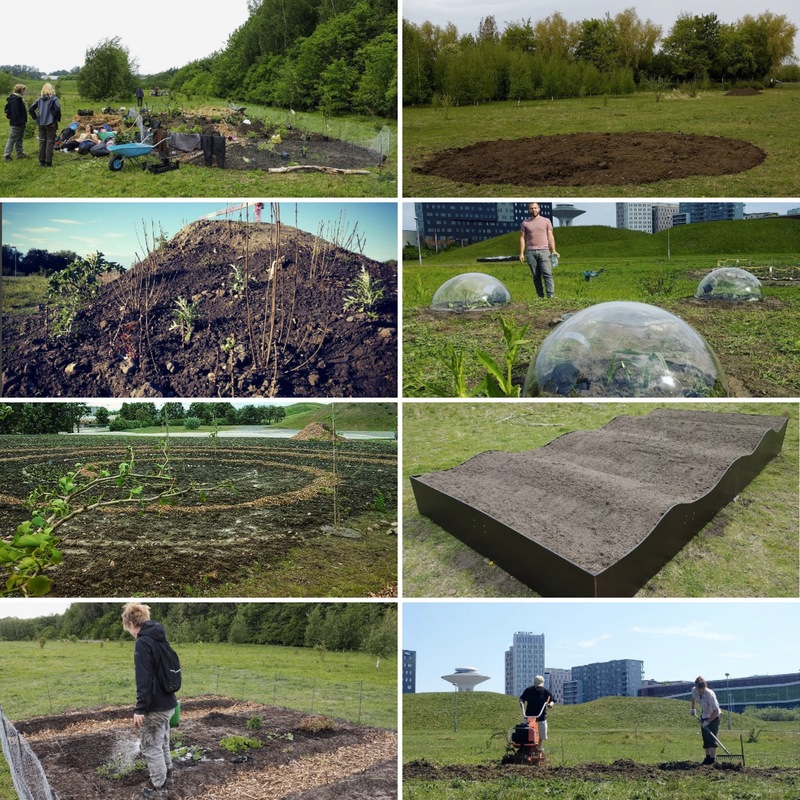 Edible Carpet: Åsa Maria Bengtsson (SE) will build a rolling mat – a magic carpet – of salad greens and edible flowers planted in oriental patterns, that can be harvested for meals. Cluster: Mary Mattingly (US) will build a forest edge landscape of edible plants. Tree of 40 Fruit: Sam van Aken (US) will grow a single tree that grows 40 different varieties of stone fruit including peaches, plums, apricots, nectarines, and cherries; and one that grows 40 different varieties of apples. Den Javla Marmeladfabriken: Helle Robertson (SE) will invite audiences to forage in the city for fruits, by knocking on the doors of neighbours and strangers, to collectively make jam, and build community. The opening will be held outdoors with food grown in the area, and the meal itself will be designed and realized by artists, where local food producers, chefs, and artists work collaboratively to develop a performative festive feast. Marek Walczak, Amanda McDonald Crowley, and the Kulturföreningen Triennal team. Agrikultura will be realized with generous support from Malmö Kulturstödet, Kulturförvaltningen; Kulturnämnden Region Skåne; and Malmö stad.